Our UX knowledge for you. Creating easy to use products and great user experiences is not merely our job, but our passion. For this reason, we are always interested in understanding the impact of new technology trends on the overall user experience. In our latest research reports and whitepapers, we look at current topics from the users’ perspective. In February 2016, Google caused some commotion by changing the placement of ads (AdWords) on the search results pages. Is the competition for the best ad placement going to intensify? And are organic results going to lose importance? 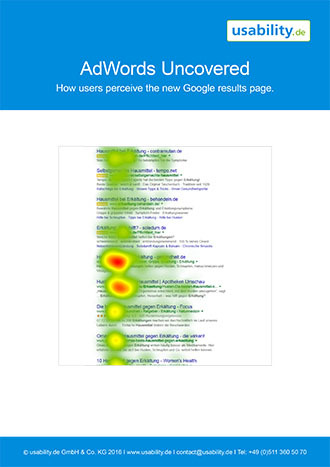 How are the users’ perception and search behavior affected by the new search results pages? We investigated these questions in our eye tracking study – with remarkable results.